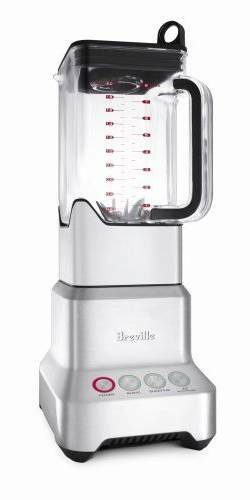 The Breville 800BLXL is a powerhouse when it comes to smoothie makers and blenders in general. Do you struggle to get your blender to work well and find yourself poking it or wobbling it to get things going and get all those bits at the bottom blended in? This product provides a helping hand by giving you more wattage and more control. One of the features that make it stand out is the quietness of operation by comparison with other blenders with similar capabilities. The system has a powerful 1000 watt motor. That is higher than most models on the market. It has two speed settings, which helps to ensure you get the right consistency. It also has a pulse feature. The system has cleverly designed blades to create a vortex (see the explanation in the video below). This helps to create a better consistency. The blades also come up close to the sides of the bowl, which allows it to keep food from being trapped and prevents any bits of food remaining ‘unblended’ in the bottom of the mixing container. One of the key benefits to the Breville 800BLXL is that it has a quieter motor. This means that you do not hear that horrible sound penetrating throughout the home every time you turn it on. The family sized 67oz polycarbonate jar is dishwasher safe, easy to clean so you will definitely use it more often than a blender that is a chore to clean up! It also works well for those who are looking for a way to make pastes, soups, stews and other thick liquids in an efficient manner. Use it if you want consistent results. The customers who bought and reviewed it indicate it works well – that it sounds quieter and works efficiently. They do like the control this system offers, too. The power is good as well, which is why so many have used it. Another key benefit is how easy it is to use. Just fill the top with some ice and your favorite fruits and you’ll have a great tasting smoothie. This blender provides an effective system that you can rely on to create perfectly blended soups, purees, drinks and smoothies. The system is so easy to use that and clean up that it is not going to get pushed to the back of the cupboard and forgotten because it is too fiddly! For those who want to use it for shaved ice and the perfect smoothie texture, the Breville 800BLXL works well, why not try it out with some of the great smoothie recipes on this site?